Klutzy is found in the newspaper! What...He's behind the trees, it's a little hard to see though, since it's just his shadow. TOP SECRET! It seems our little friend, Klutzy, has come back to Club Penguin! Herbert better be careful this time! All of our agents are PREPARED! 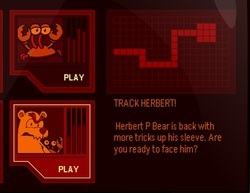 Help the EPF to catch Herbert once and for ALL! 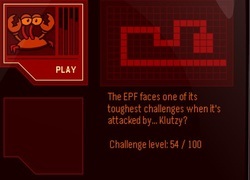 The EPF faces one of its toughest challenges when it's attacked by...Klutzy? Klutzy may look easy to beat. But he is really HARD! I don't get it, he has so many bots. I wonder how he installed all those into the computer mainframe? A mystery never to be solved! 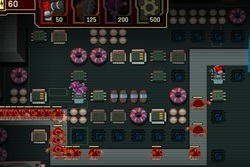 This is the EPF Command Room. It is where the Director gives out his orders to all of the secret agents. Could the Director be Herbert in disguise? We might never know! Let's see if you penguins can figure out the Director's TRUE identity! This question needs time for answers. What could this video be telling us? Or could the Director be Aunt Arctic? UPDATE: AUNT ARCTIC MIGHT BE THE DIRECTOR! IN THE NEW CP MAGAZINE, IT SHOWS AUNT ARCTIC NEXT TO THE DIRECTOR, AND IT SAYS SOMETHING! "Newspaper editor, puffle fan, drinker of tea... Aunt Arctic is really busy. REALLY BUSY. I think there's more to her than meets the ear. I mean eye." There is good news and bad news. The good news is, we might be able to sail to RH Island soon. But the BAD NEWS IS, the Director might not be the real Director! As it says on the picture: The_Directors_Identity. This is bad, who could the Director REALLY BE? 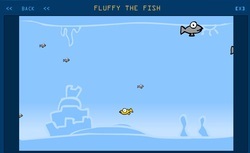 On the Beta Team, you can play lots of games, like Rollerscape, Fluffly the Fish, or Yum Yum Yuck Yuck! This is the Beta Team Entrance, where you have to type your penguin name and password. Oh, yeah there's gonna be a mission called Operation: Black Out! HERBERT IS ATTACKING! HELP THE EPF! BEAT HIM! LOOK AT THIS VIDEO! IT'S HERBERT'S SECRET HIDEOUT!